You can turn an ordinary Halloween party into something exciting by incorporating some unexpected elements into the mix. Surprise your guests with some spooky decorations, exciting games and a delectable menu that they will never forget. A Halloween party can be fun for kids of all ages. Using a mix of creative decorations, food and games is a sure way to bring screams of ghoulish delight to your party plans. 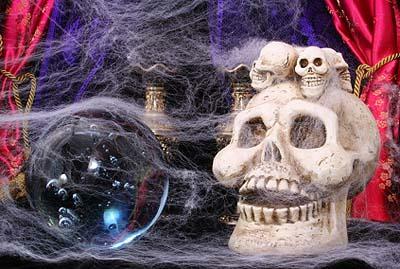 Get in the spirit by creating a background stage that simply shrieks Halloween. Icky Sticky Cobwebs: Cut some good white or grayish string into four foot length pieces. For the best effect, choose a dimly lit room to hang the string onto the ceiling with tape. Now just before your guests arrive, dip the ends of the string into some water. When your guests walk through it, they will be in for an icky surprise! Glow in the Dark Ghosts: Get some glow in the dark paints, balloons and some black crepe paper. Use the paint to draw faces on the crepe paper, and then wrap them securely over a helium-filled balloon. In the dark, it will look like a bunch of eyes moving about the room. Fog: Create instant fog by placing dry ice in a good-sized container with warm water. Set the container out of the way on the floor next to a wall. Scary Monster Footprints: Using a large unused kitchen sponge, draw the shape of a footprint. Next, cut out this shape carefully. To create the footprints, dip the feet into some washable paint and create a path up your sidewalk to your front door, or other location where your guests will venture. Green Pumpkins: For a green "pumpkin," use bell peppers and carve a face into them. The red and yellow peppers are also a fun choice to try. Haunted Room: For a creepy effect, cover windows with dark blankets, bags or foil to block out light. Then cover your furniture with black fabric. Be sure to remove any valuables to avoid any potential accidents. Liver Toss: All you need are some clean thawed beef livers and a large bowl that can be used as a caldron. Have your guests try and toss the livers into the bucket. Halloween Word Game: This game is more appropriate for older kids. See how many words your participants can find with the word Halloween, Scarecrow or Jack-o-Lantern in five minutes. Halloween Bingo: This is a traditional bingo with a different twist. Instead of calling out letters and numbers, use images. Create your own bingo playing cards with a Halloween them: ghosts, witches, pumpkin, skeletons etc. Bobbing for Apples: This game is always a classic and simple to set up. Get plenty of apples and a large tub of water and you're ready to play. Participants put their hands behind their backs and try to retrieve apples from the bucket using only their mouth. Scary Objects: This is a memory game with a Halloween twist. Fill a tray of about 20 to 25 Halloween related objects. Give your guests about 60 seconds to see all the items, and then recover the tray with a cloth. Whoever remembers the most objects wins. Brain Soup: Add green food coloring to matzo ball soup or chicken and dumplings for a truly creepy effect. Witch's Brew: Mix cranberry juice, orange juice and ginger ale with enough food coloring to make the brew gray in color. Eyeballs: Hard-boil eggs then remove the yolks and fill them with whipped cream cheese. Add red food coloring for a blood shot look. "Smoke" or "fog:" You can rent a fog machine from a party rental store. You can also purchase cans of "smoke" that you spray in the room prior to the party. It lingers for a couple of hours. Lab equipment: Strategically place some evil-looking tools, nuts, bolts, Bunsen burners, beakers and chains around your counters. Use a hot plate to display bubbling green liquid (a little food coloring in water works wonders) and top it all off with some spider webs and a standup Frankenstein. Experimental food and drinks: Even if you plan to serve party basics, you can give everything a lab feel with some simple twists. 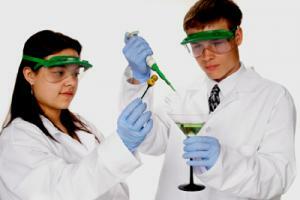 Serve lime jello shots for a great lab beverage. Coat your popcorn with grated parmesan cheese to which you have added a little green or purple food coloring. If you're serving buffalo wings, make sure everyone knows they actually came from tiny mutant buffalo. Looking for some classic alien fun at your Halloween party? Turn your home into Area 51 and give your guests their very own alien encounter with these party ideas. Hang small toy UFOs from the ceiling; invest in a few inflatable aliens to place around the room. Want to do your own alien autopsy? Fill a silver balloon with jello, using a funnel. Tie it closed, place it on a "gurney" (a countertop or table will work), cover around it with sheets and get ready to slice into the goo when everyone has arrived. Purchase tiny plastic babies and mason jars. Place each baby in a jar, fill it with water, add a drop of food coloring and seal. Place them in rows on shelves or the mantle. Play some eerie space music. One way to have a Halloween party prior to the big night is to invite children to come to your home and decorate pumpkins. This works best with children ages 8-13 because of the small items used to decorate pumpkins, and the need to work with paints and permanent markers. The object of this particular party is to decorate the outside of the pumpkins while eliminating the mess (and sharp utensils) used in carving them. First, obtain pumpkins and gourds from a local store or nursery. Then go to the local craft store for items such as craft paint and paintbrushes, Sharpie pens, tacky glue, large wiggly eyes, felt, sequins and even pumpkin decorations, if available. Place all of the items in pie tins or large bowls on tables covered with newspaper and let the kids go crazy with creativity. A movable feast is a popular way for everyone to be involved, even if they can't leave their home. The idea is that each person will handle one part of the feast. For example, someone has the main course, another the dessert, another the hors d'oeuvres and the last house will host a small party right before the kids head out. This way even moms with small children can enjoy the company of friends and everyone shares in the preparations. Families can decorate their homes any way they wish. The other bonus is that the children will have eaten dinner before they collect all of that candy! Create a Halloween music playlist and have it playing in the background. Play scary Halloween movies on the television so that guests can sit back and have a thrill. Host a contest for best costume. This can be done with categories such as best couple costume, scariest costume, most unusual costume, etc. Award a small prize to the winners. Whether you have a Halloween party at home for the kids or in a classroom, the more fun party plans you have, the better. Coming up with creative elements to add to your party will ensure that all of your guests will have a frighteningly good time!